Today marks the first official day of spring, new season new hair that’s my mane objective! A few months ago I reviewed John Frieda’s Visibly Brighter Lightening Treatment, it exceeded my expectations and I’ve been recommending it to everyone since. Last week my hair colour was looking a bit dull so I decided to revive it with the Visibly Deeper Colour Treatment and Colour Protecting Shampoo & Conditioner. I was a little excited/nervous at the start because I’ve had all types of experiences colour treating my hair in the past. I had absolutely nothing to worry about because the trio worked a charm. The treatment only took 10 minutes in the shower and it was very easy to use, it enhanced the dark tones in my hair instantly and infused it with a deeper colour. I have been using the Colour Protecting Shampoo and Conditioner since applying the treatment and it has preserved the brunette colour whilst keeping my hair healthy and replenished with each wash. 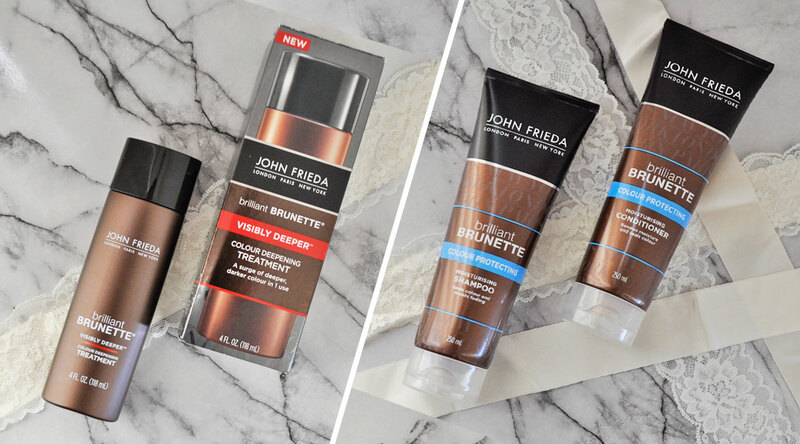 Which is your favourite John Frieda product? Let me know your thoughts down below! Lovely review, enjoyed reading it. Thank you very much Saabri! My hair needs some help at the moment. I will so give this a try now. It won’t disappoint, John Frieda’s range of products are amazing! Looks so amazing, I need to try that out! Thank you so much for sharing! As someone who has colored her hair a lot, I have no idea of its natural color anymore, but it’s brunette now and I love it! I’ll have to give these a try! You have a beautiful blog!